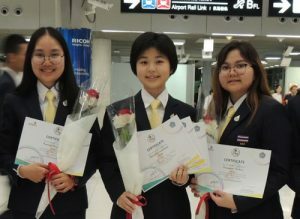 A Chemistry student from Mahidol University International College (MUIC) received two major awards in the Asian Science Camp (ASC) held on August 3-9, 2018 in Manado, North Sulawesi, Indonesia. Ms. Wanutcha “Soon” Lorpaiboon was the lone representative from MUIC, joining several other students from different universities in Thailand. Ms. Wanutcha received certificates and a figurine of a tarsier as a token gift. She said that her group (composed of five students from different countries) won the Best Poster Presentation Award based on the topic “Cleaning Up the Ocean.” On the other hand, during the question-and-answer forum in a discussion panel featuring seven scientific experts from around the world, Ms. Wanutcha’s question about DNA earned her the Best Question Award.